FOXBOROUGH, Mass. Tom Brady can't stop smiling these days. Or winning. Five days after becoming a father for a third time  something that brings the biggest grin of all to his face  Brady threw four touchdown passes, leading the Patriots to a 42-14 rout of the Houston Texans. If the game was a measuring stick in the AFC, New England and its star quarterback aced the test with a seventh consecutive victory. Houston failed it. "It's a Monday night game," Brady said. "We have played in a lot of big games in December." A matchup of the top two scoring teams in the league was a mismatch from the outset. It took New England (10-3) only one possession to start its scoring barrage as the Patriots surpassed their average of 35.8 points per game. "It needs to come together now, this is the perfect time for it," said Brady, whose his wife, Gisele, gave birth to Vivian Lake last Wednesday. "She is doing very well," Brady said. "It's been a great week, a great way to end it." So look out. That familiar sight is the Patriots, who already own the AFC East title, romping through December, looking like a Super Bowl team. "We can't predict the score but we know we can dominate games," said Devin McCourty, who had a first-quarter interception. They often dominate late in the season; this was their 21st straight victory in the second half of the schedule. "It is always good to play in Foxborough in December," linebacker Jerod Mayo said. "When you go out and perform the way you do, I think Foxborough is going to be a tough place for anyone to come and play." The Texans (11-2) discovered that quickly, and now they need to look back at the Patriots gaining on them in the conference standings. "We got our tails kicked," Texans coach Gary Kubiak said. "When you've got an opportunity to make a big play, you can't miss it against a team of this magnitude. We turned around and it was 21-0 pretty quick." Wes Welker's 31-yard punt return and 25-yard reception  the 107th straight game he's had a catch  led to Aaron Hernandez's 7-yard score to start the onslaught. 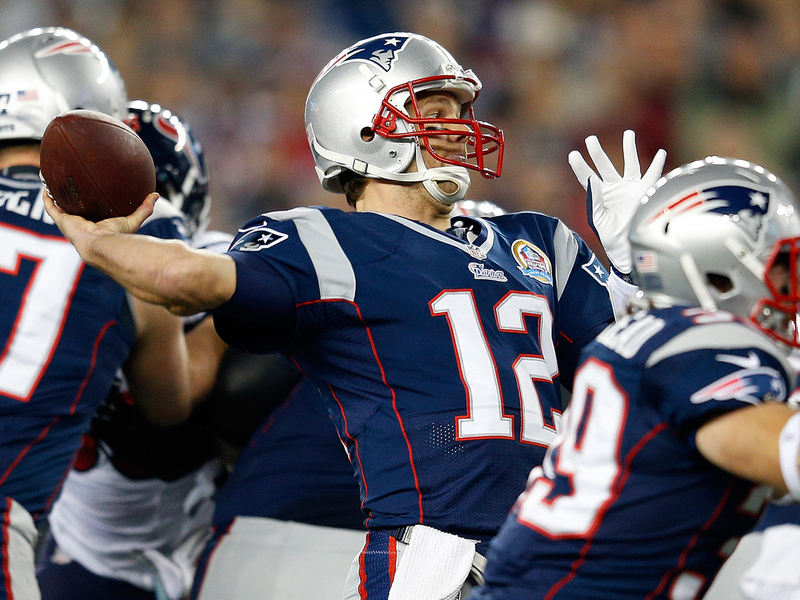 That gave Brady 45 consecutive games with a TD pass, third longest in NFL history. It also set the tone. Houston, which had won six straight, threatened on its next series, only to have Matt Schaub force a ball into double coverage in the Patriots' end zone. McCourty picked it off and returned it 19 yards, setting up more pinpoint throws by Brady, who finished 21 of 35. He couldn't miss if he tried in the first quarter, his receivers were so uncovered: Brandon Lloyd for 14 yards, Danny Woodhead for 18, Hernandez for 13, then Lloyd for the 37-yard TD to make it 14-0. Texans defensive coordinator Wade Phillips could only shake his head in disgust at his players' inability to challenge the Patriots. At the end of a 70-yard drive helped by a 26-yard interference call on Danieal Manning, no Texans were lined up to Brady's left in front of Hernandez. A quick snap, a quicker pass and the tight end waltzed into the end zone. "We've got to look in the mirror at what we did tonight," Kubiak said. New England was headed for its 20th successive home win in December. "These guys feel really good about the way they played tonight and they should," coach Bill Belichick said. Houston was headed back home wondering not only how it could measure up to a perennial championship contender in the future, but if it could hold off surging Indianapolis in the AFC South. The Texans have a two-game lead but face the Colts (9-4) on Sunday in Houston, then in the season finale at Indianapolis. Although the Texans have clinched at least a wild-card berth, they haven't had a truly convincing win since October. This was a convincing defeat, however  although they got on the scoreboard in the third quarter with an 88-yard drive capped by Arian Foster's 1-yard run. But Foster was held to 46 yards on 15 carries. By then the Patriots had scored their fourth TD, a gorgeous 63-yard throw to Donte' Stallworth, who was re-signed last week to replace injured Julian Edelman. It gave Brady his 18th game with at least four TD passes, moving ahead of Hall of Famer John Unitas for fourth all time. Brady nearly had a fifth as Woodhead broke free on a screen pass early in the fourth period. Texans standout defensive end J.J. Watt, who was pretty much invisible otherwise, forced a fumble, but the ball soared 11 yards into the end zone, where Lloyd fell on it for a 35-7 lead. Stevan Ridley made it 42-7 with a 14-yard run. The Texans have allowed 42 points in both losses, the other coming against Green Bay on Oct. 14. Texans backup quarterback T.J. Yates scored on a 1-yard run with 2:00 remaining to close the scoring. CBSSports.com's Mike Freeman says the rout was a convincing statement by the Patriots. "There is no shame losing to Tom Brady in a big spot. Many mere mortals not named Eli Manning have done just that. But as the season's end nears, and a playoff pecking order is established, this game did two things, none of them good for Houston," Freeman writes. "It established the Patriots as the favorites to win the Super Bowl. The Broncos can be argued, so can others, but after this, it's almost impossible not to like the Patriots as championship material after they manhandled an 11-win team."